Election fever was in full swing last week as four Cardston-Siksika candidates made their case to be elected. 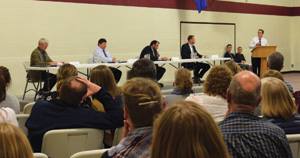 On Tuesday, April 2, a candidate forum was held at Calvin Christian School west of Coalhurst, for candidates running in the Cardston-Siksika riding. The forum was organized and run by the students, and was attended by Ian Donovan (Independent), Casey Douglass (Alberta Party), Jerry Gautreau (Freedom Conservative Party) and Joseph Schow (United Conservative Party). The NDP candidate, Kirby Smith, and Alberta Liberal Party candidate, Cathleen McFarland, were unable to attend. While Marc Slingerland, the school’s principal, had previously run for the UCP nomination in the riding, he stressed at the beginning of the forum that he was not involved in developing the student-posed questions. Candidates were given a series of student-generated questions, rapid fire questions and questions from the audience to answer. The forum covered a variety of topics, from health care, the carbon tax, LGBTQ students and the rights of parents, infrastructure and education. The first question the students posed to the candidates was if you or your party feel that Bill 24 Infringes on the Rights of parents to control their children’s education and what would you do to resolve this? Bill 24, Act to Support Gay-Straight Alliances, prohibits schools from informing parents if their child joins a Gay-Straight Alliance. Proponents of the bill say it protects LGBTQ youth, while opponents say it violates parents’ rights by not informing them of what their child is doing in school. The Calvin Christian School Society is part of a group of parents and faith-based schools who are challenging Bill 24. Freedom Conservative Party candidate Gautreau said he believed parents have the right to control their children’s education, but he was against outing students, as he’s seen some parents disown or throw out their kids in response. Donovan, an Independent candidate, said as an independent, you vote for what your constituents want. He also said as a parent, “I want to know what my children are doing”, and he agreed with the UCP that they needed to protect a parent’s right to know what their children are learning. United Conservative Party candidate Schow called Bill 24 an “infringement on parental rights and authority”, and said people should not be afraid that their children’s school would lose it’s accreditation and funding. Another student-generated question asked that with the increasing stresses on the healthcare system, how would the candidate or party increase efficacy in the healthcare system to better serve all Albertans. Gautreau, the Freedom Party candidate, said the Freedom Conservatives would look at how many hip surgeries or similar procedures can be done a week, and pay the people involved according to what they’re actually doing. This, he said, would reduce costs and wait times, “and we start actually looking at what we can do with the health care system itself”. Donovan supported utilizing smaller hospitals in places such as Pincher Creek and Vulcan for replacement surgeries, and gave credit to the NDP for utilizing a five-year program in the health care system. He also talked about cutting down on management and getting people who are willing to do so, to go somewhere else for replacement surgery. “If you want to, have the money, and I know this causes quite a issue with some of our Lethbridge-centre friends, go down to the States, or go down to wherever or out to B.C., get a replacement done there, if you have the funds to do it. If you have the funds to do that, that will make the waiting lists shorter for other people who aren’t willing to spend that kind of money, or unable to do that,” said Donovan. Schow said that Alberta has a wonderful health care system, but there are so many inefficacies in the system that it is causing problems such as long wait times for replacement surgeries. They needed to get rid of the inefficiencies and put those resources with the front line workers. Douglass highlighted things such as getting rid of jobs that haven’t been filled in a year to help cut down on middle management, and providing a more even “dollar spread”, saying that research has shown that in Calgary the dollar amount spent per person for health care was $1,600, while in smaller places such as Red Deer it was $228 per person, significantly smaller. Providing more autonomy in the different zones for decision making, ensuring patients receive the necessary tests and treatments and reducing emergency personal wait times in hospitals to less than half an hour are other policies he said the Alberta Party would put forward. In response to a rapid fire question on whether they would refer to run a deficit to sustain necessary infrastructure than have a balanced budget, all candidates said that they would run a deficit. However, Schow stipulated “as long as it’s all paid back” like any business, Douglass noted there are “more ways to fund infrastructure” such as through private public enterprise systems, Gautreau said it would be based on priority and they need to “take the politics out of it”, and Donovan noted that “there are times you have to borrow money to sustain good infrastructure”. Another rapid fire question posed by the students asked the candidates if they were in favour of keeping the current minimum wage, reducing it or increasing it. Gautreau said he was in favour of keeping it the current rate of $15/hour, and then later reviewing it “to see if we can increase it”. Donovan was in favour of keeping it, as “it seems to be working, people have adapted to it”, and he’ll leave the issue of lowering it for younger workers up to his constituents. Schow said the UCP was looking at a tiered system, as repealing the $15 minimum wage would be difficult as people were making investments based on it. Douglass said he was in favour of up to a 15 per cent reduction in minimum wage, but “that then, is the decision of the employer”, and they wouldn’t be as stringent on the hour limit. One submitted question asked the candidates that as Ottawa and other provinces being the main obstacles to the pipeline, what was their plan to enforce the cooperation of Ottawa and the other provinces, as otherwise it was just talk and no action. Schow said the UCP has not formed the government yet, but they were already taking action, having joined the Saskatchewan challenge against the carbon tax and Ottawa, talked about turning off the taps to B.C., will sue the federal government over the carbon tax and hold a referendum on equalization. Douglass said there will be a penalty to B.C. as the Alberta Party will provide incentives to get companies to move back to Alberta and Calgary. The Alberta Party will ensure a healthier, stronger environment for oil processing in Alberta, and the province will collect income taxes itself, instead of having Ottawa do it. Gautreau said the Freedom Conservatives wants to end equalization payments, adding “not saying it’s my belief, this is a party belief” and said they would consider holding a referendum on independence, although he said he was “a Canadian first, I’m an Albertan second”. Cutting B.C. off, ending the carbon tax and join the court case against the federal version are other methods he raised. However, he said they also needed meaningful conversations with Ottawa, no matter who is in government, or how they feel about them. Taking the opportunity to give the lone rebuttal of the evening, Schow spoke against ending equalization, as it helps other provinces without the resources to support their population with good education and health care. “I’m not happy with the lack of accountability from the other provinces, but I’m not in favour of completely ending equalization. Because that means we’re pulling the rug out from other provinces who depend upon them. What I want is a fair deal for Alberta,” said Schow, adding ending equalization was “not realistic” and he didn’t think it was “Canadian” to do so. Donovan said the challenge with taking the legal fight to Ottawa is that taxpayers would be paying for both the provincial and federal lawyers. Referring to UCP leader Jason Kenney’s time as an MP, he said that Kenney “thought it was okay for equalization then, when they needed the money from us”. Donovan said they needed to sit down and be reasonable in negotiations with Ottawa and the other provinces, and criticized the rhetoric coming from some party leaders in Alberta about Prime Minister Justin Trudeau. The provincial election goes April 16. To confirm if you are registered to vote, log on to http://www.elections.ab.ca and click on the register to vote link.